"Sometimes our communities have not supported girls to play football, it is considered a man's game." The words of Kenya women's national team captain Mary Kinuthia reveal the enormity of their achievement in qualifying for the 2016 Africa Women Cup of Nations. Not only were the Harambee Starlets, as they are known, up against tough competitors on the field, they also faced opposition off the field - from their compatriots. "At times we have had to come out and go against our parents or guardians to be able to do what we like the most, to play football," Kinuthia told BBC Sport. The risk has been worth it for Kinuthia and her team-mates, who have secured a first appearance for Kenya women at an international tournament. Kenya reached the finals, which take place in Cameroon from 19 November to 3 December, by beating Algeria on the away goals after a 3-3 aggregate draw over two legs. That there has been no domestic women's football league in Kenya makes the feat even more remarkable. "It has not been an easy journey," Kinuthia added. "The league has not been there but we have passion. "And for the first time we were given the privilege to be in a training camp. The federation has been so supportive, we were given everything we needed: uniforms or equipment. "It was tough but us players we had faith and determination - and our spirit motivated us." Kinuthia also revealed the players were driven by their belief they were good enough to qualify - despite their lowly Fifa ranking of 133rd in the world - and also by a desire to shown those Kenyans who are critical of women's football that the sport is not solely for men. "We told each other we would qualify if we were given the chance," she said. "We know Kenya ladies have the talent, we just lack exposure. "We wanted to make people realise that women can make it and since last year we have been singing a song 'women will qualify first before the men'. "For the first time it has happened. In the past it was all about the Harambee Stars but now it is about the Harambee Starlets." Kinuthia is not content to sit back and revel in the team's achievement. She is eager for the team to use qualification as a platform for greater success. "Now we have qualified for the Nations Cup I think we will improve the Fifa ranking and we will perform better," she said. "Our target is to finish in the top four at the tournament and book our place at the the 2019 World Cup." Team manager Doreen Nabwire is working on a plan to make that dream come true. 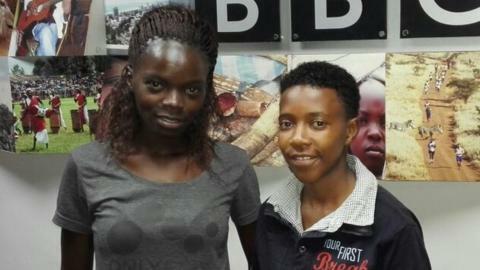 "This is a turning point for Kenya women's football, " she said. "We are planning for a domestic league, which is supposed to be kick off next month and I hope the players will have adequate time to prepare. "The league will help the players to prepare, allowing them to play at the highest level and to compete, ensuring their fitness levels are maintained. "The president of the federation is also trying to organise a training camp for two or three weeks, in Japan, China, Germany or the USA. "The plans are under way, we also want to move around the country playing friendly matches - against boys or girls - and ensure we are active. "Our team is young, we have maybe two experienced players, but we believe our young players have what it takes to take us to the next level."